Carolina Blinds and Shutters make your shutters to measure, this allows us to fit almost any shape. 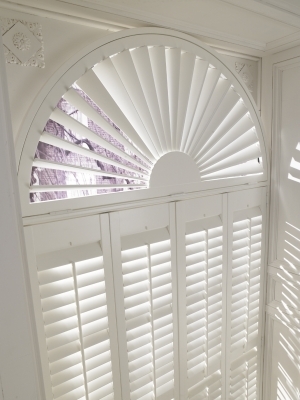 We have experience in fitting arches, circles, triangles and many other unique shaped windows with interior shutters. Just because your window is a unique shape, that doesn't mean that you can't benefit from the added security of a window shutter. Window shutters can keep the unique shape of a window as well as adding customised privacy and not only do plantation shutters make your window more secure, they also completely improve the aesthetics of a room.